When considered broadly, it is clear that some of the common themes which have posed ongoing threats and complications for business have existed almost from its conception. Within my human resource study, the issues of flexibility, productivity, the work/home divide & inequality in perceptions of value of paid versus unpaid work, cross cultural communication, strategic change, organizational behavior, which we commonly looked to "culture" as a key to these processes. Across my studies and life learning in other arenas I’ve found that commonly, the issue experienced as A in one situation will then present itself as B in another. Much like that commonly explored concepts of connectivity which is intrinsic in the nature of a connected world. In this case, it stands to reason that by overlapping and integrating the perspectives common across a number of areas or disciplines within which a context is formed, the understandings of each of these separate arenas could in turn be enriched in understandings. There are a multitude of characteristics and elements which have been identified within considerations of SNSs in this framework. There is a video included in this section which provides a brief outline of the varying considerations, along with Appendix B, which outlines previous considerations within this framework., These considerations include a more thorough reference list of the key elements to network theories. However for this particular case there are a few that were distinctive, first “human agency”, which presents a disadvantage as “our brains don’t adapt as quickly as the technology works, Humans have limited capacity to process information at any given time” (Rutledge, as cited in Greenstein, 2010). In a Ministry of Economic Development report of the case study businesses showcasing the integration of ICTs, Gowell, Corbett, Mishra & Ryan, (2005) simply state “humans being processors of information”(p3). We tend to overlook the fact that the ICTs developed are based off pre-existing processes and are designed to enrich and ease them as such. 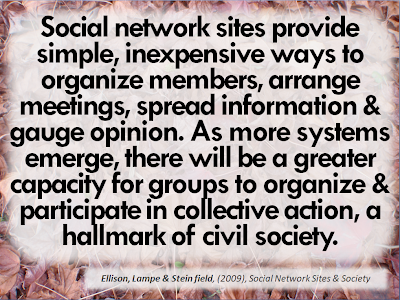 There are some interesting insights to come from considering user ship between the networks, (Mirchandani, 2010) and between different social groups, some of which has been touched on in the online document “Facebook vs LinkedIn”. 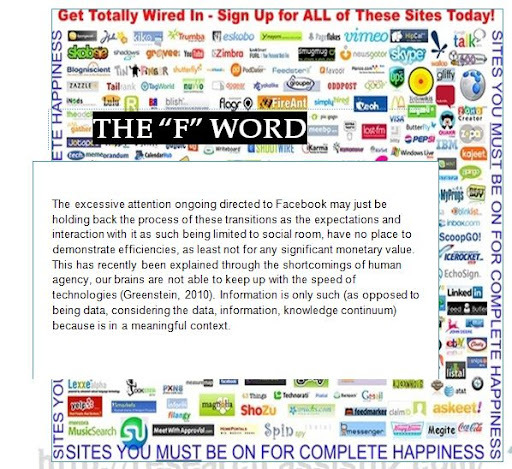 Also considered relevant were various elements of connectivity, strength of ties, and risk of “homophily”, which has been referred to through notation photo form and further explored online. The research by Kolb (2002, 2008) is of particular interest in its reference to “requisite connectivity”, which has been particularly evident to me in the information overload experienced while collating research. Whilst realistically covering two of the big three, for the purposes of maintaining simplicity, these have been grouped together going forward within this review. Whilst there have been extensive studies within the field of “small business” in the NZ context, particularly by public sector agencies, the majority of these do not focus on what would technically be considered as one. The majority of government initiatives and studies feature considerations of businesses with turnover of $1M+ or at least 6 employees (MED, 2009). Within the broader definition of ‘enterprise’, it is clear that despite our concerns for SMEs in NZ, who remain the focus of this review, potentially this calls for more direct consideration and discussion of micro business and entrepreneurial collaboration (NZTE, 2009). This increasing trend towards casual and project based employment seems set to continue. If managed adequately this trend has potential to afford the SME, many of whom struggle to commit to the ongoing expense and added complications which arise from the employment arena, value efficiencies and benefits. By adequately utilising the tools and services afforded through SNSs, the ‘knowledge worker’ in a ‘digital economy’ is going to present a different type of employee and market. SMEs are well placed to handle such inevitable changes ongoing in markets. 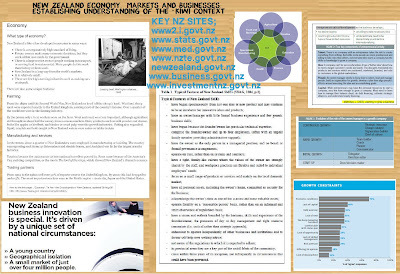 Considerations of NZ SMEs also hold particular relevance for SMEs internationally; the “representative sample” presented by our markets have long acted as “test markets” for large multinational corporations such as Vodafone. As owner / managers largely reported a lack of time as a barrier to growth (Read, 2005), the short term orientation held by many (Knuckey & Johnston, 2002) and the aspirations for more personal time by attempting to achieve work life balance (NZTE, 2009) all clearly will be inevitably influenced as a result of ongoing changes. Furthermore, and with potentially more value (as well as potential hazards) to owners / managers is how time is managed both at an individual and also at organisational level when it comes to work. If the boundaries of work and life are irreversibly intertwined already for many workers, the stereotypically self reliant, over worked owner / manager types are understandably going to experience overload at some point. For small businesses in New Zealand, while we are well practiced and comfortable with networks, the changes in SNSs have not yet been embraced. However, it appears, despite what one might expect, that the prolific members of micro businesses in our markets are not as dynamic and innovative as could be hoped. And this group is still not recognising or achieving anywhere near the kind of exponential opportunities it offers. The rare few have indicated some of this to be had. And the likes of Kim Crawford wines, a business which was established, operated and grown, almost entirely by tapping into and creating a variety of key networks. There are a number of elements of each of these topics that demonstrate sustain influence on and the other elements also. In fact it was evident in the amount of extra additional pages added to the wiki. As SNSs alter the concepts and restrictions imposed by the limits of space and time, the “rules of the game” have ultimately changed. While we are now able to access markets from NZ which have never been accessible to service before now, even the difference of time zones demonstrates the critical need for considering the redefinition of “work hours”(nef, 2009). However this issue runs through the topics having substantial impact on varying levels in a complex manner, so has been widely in the past. Through our struggles to catch up with the ongoing changes in ICTs, which to reiterate once again, are anything but unique to us alone, the approach adopted widely from industry and community standpoint appears to put the user in the role of working for the technology. "It's about people first and technology serving people -it's their ability to connect individuals to things that matter to them" (Cunliffe, 2007). Whilst these will be problems, ultimately, we have no choice; we can either do what we do best and innovate or become left behind and the Luddites of modern society (Cunliffe, 2007, Friedman, 2007). However avoiding the inevitable will not prove helpful, SMEs may realistically continue to find the ever changing face of technologies overwhelming, but how will this place them once it becomes a legal requirement that business activities with government are primarily conducted online? NZ currently in good position and clearly our government are supportive of this development; we are in a strong position to use what we have to develop. This review aimed to explore and revise the vast and differing aspects, elements and considerations of the place of New Zealand and New Zealanders in the “digital environment”. A broad conceptual overview has been undertaken to consider the areas of overlap and potential for integrated and collaborative considerations. By doing so I hope to have highlighted some of the areas where the most potential for benefit is demonstrated. After considerable review of the commonly faced obstacles to growth for NZ SME owners and entrepreneurs, there are various opportunities which are present within such stages and vary in relevance depending on the type of business considered. Those representing the population whim are not willing to take the risks necessary for growth, demonstrate significant resistance to change. The inevitable complications and uncertainties intrinsic to the interconnected work is a given that complications will arise as we progress as a society into the future. “Businesses who ignore social networking are being left behind” (Jagger, in Shaw, 2008). 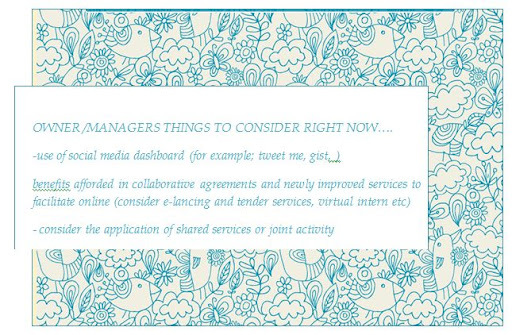 Without adequate attention to SNSs, businesses may get “ripped up” on services like Twitter. Having a presence and “defending your company, fighting for it, listening to what people are saying about it, that’s reputation management” (Shaw, 2008, p27). Whilst many people report significant concerns about their information being online, the difference in a “digital environment’ is that regardless of whether you choose it to be or not, your personal information will inevitably be out there. Even if one withholds personal information, there are no effective strategies to prevent third parties from hosting information that they hold about you in a publicly accessible format. So, especially relevant to Millennials, who feel that restricting their exposure online will in some way protect them, we need to consider the new redefinition. The way to manage one’s reputation and perception in such a market can be widely strategized and explored, but put simply, “the best form of defence is a strong offence”. 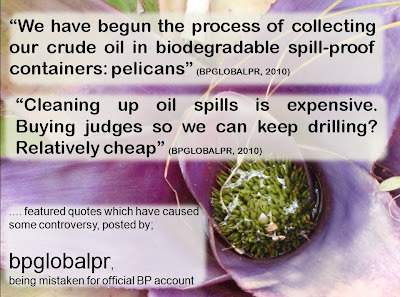 Consider the BP Gulf Coast oil spill disaster, where a “satirical” fake twitter account set up in the name ‘bpglobalpr’ features ten times more followers than the official BP America account, who have tried and failed to have the fake account shut down as BP navigates unknown PR territory. (Brown, 2010). This shows a key shortcoming in public relations management on SNSs, in that BP has a twitter feed of its own, but has failed to publicize it sufficiently to exert suitable control over its image. SMEs have an advantage over multinationals in this respect, as their smaller size enables them to more efficiently handle and closely monitor their interactions (Pages & Garmise, 2003). Further to this, tools such as Tweetme and Gist centralize social media management by integrating the various mediums into an automatically sorted feed (this has been explored in more detail on the site, or find it under the SME viewer). Firstly the role and limits of being “technically capable” are still broadly unappreciated within societies. Despite being technically proficient at using a range of simple software available (as demonstrated by the avid use of Facebook and other SNSs among many supposed technophobes), most ICT users in the NZ business community still lack confidence in this area. (MED, 2008). Sites such as LinkedIn have enjoyed great success overall, but typically tend to be more popular with an older user base. This could be linked to the reluctance of “Millennials” to divulge such personal information online. (Pew, 2010). However in a new economic landscape, where knowledge workers transfer skills and services more commonly than goods, NZ must ensure that consideration and support for the millennial generation is not overlooked while the main emphasis of increasing capabilities is fixated on the older generation. Overall, without ability to expand further considerations in their review, it is important to acknowledge security as a multidimensional and ongoing concern, and one which would benefit from the adoption of a collaborative approach. But the concerns of security are not at all unique to Millennials and the public agencies progressing through the e-government changes. It is intrinsically an industry-wide issue which we have yet to completely satisfy. Internet giant Google, whose services and tools have been heavily relied upon to develop these projects, continue to face ongoing security concerns and ultimately hesitation from SME owners over joining their enterprise “cloud”. Despite aligning themselves with market leaders, Positini, developing special “educational portals” regarding the privacy and security and releasing “white papers” on their processes and approach, they continue to struggle promoting the concept of the crowd to the main stream at this time. (Rao, 2010).